Posted 11-6-2018 by Miranda Fulmore. Gov. Kay Ivey takes the official title as the first Republican female governor of Alabama after winning Tuesday’s midterm elections. Ivey, 74, rose to the position after former Governor Robert Bentley’s alleged affair with an aide and ethics violations. She defeated Democratic challenger and Tuscaloosa Mayor Walt Maddox with 61 percent of the vote, according to preliminary results. 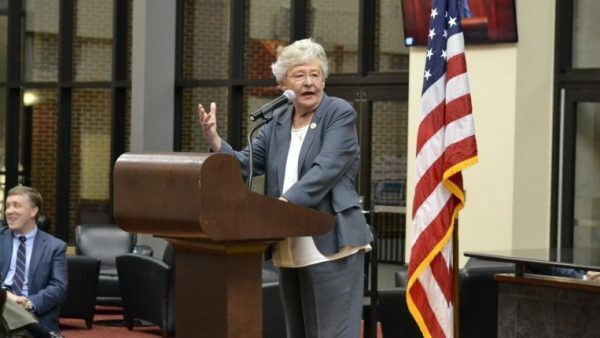 At a campaign party in Montgomery Tuesday night, Ivey thanked her supporters for their votes and took a swipe at critics who claim she’s covering up major health issues. On the campaign trail, questions arose about whether Ivey’s refusal to debate Maddox would affect her race. But Ivey fully expected to be elected to a full term as governor. Ivey told the crowd she was the first lieutenant governor to take over the governor’s office and then be elected to a full term. Meanwhile in Tuscaloosa, the mood at Maddox’s camp remained optimistic and positive, but turned once the Associated Press called the race for Ivey. After conceding, Maddox congratulated Ivey and asked his supporters to support the governor. Reporters Alexander Richey and Troy Public Radio’s Kyle Gassiott contributed reporting.